Blockchain and blockchain-based cryptocurrencies are all over the place these days. Is this just a fad or something that is here to stay? Are we talking about a valuation bubble or is this just the very beginning of a game-changing trend? I could not tell, and I dare say that the vast majority of people - even experts and those very familiar with these topics - don't know wither. In any case, I have been wanting to write a bit about this as, little by little, I am getting more immersed and interested in this ecosystem. I am not in a position to give a master class of any kind on blockchain and cryptocurrencies, so I will just jot down some notes about some topics that I find particularly interesting, in particular concerning the financial sector. By providing an open, decentralized ledger of transactions, blockchain technology is challenging the status quo of information registration, authentication and distribution. In addition it is expected to provide additional transparency and lower transaction costs - I like how IBM simply and practically explains in this video how blockchain works. Blockchain is not just a buzzword any more and a lot of applications and ecosystems are being built on blockchain across industries, including the broad financial one. One of the main challenges that I see is how blockchain-based applications are going to fit with existing legislation. One thing is disrupting processes and a different one is circumventing applicable laws which, in most cases, have not foreseen anything remotely close to blockchain. A good example of this tension is the SEC's decision on initial coin offerings (ICO), according to which crypto tokens are to be regarded as securities under U.S. law. Renowned VC investor Fred Wilson wrote a blog post about this recently. I am sure other countries will follow suit. Again, ICOs may be a a way to disrupt money raising via cryptocurrencies; a different one is getting away from legal guarantees and requirements. A few weeks ago I came across the attached chart, which provides a pretty good view of this new ecosystem of cryptocurrencies that a month ago was valued at a "market cap" of around $80 billion. Yet Bitcoin, Ethereum and Ripple make up the most of that ecosystem, there are now 800+ cryptocurrencies out there. 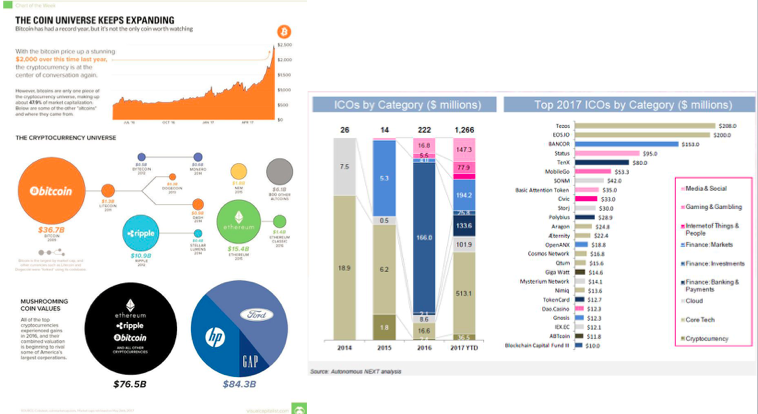 According to a Bloomberg article, as of last July, more than 90 ICOs had taken place, resulting in more than $1 billion being raised - which exceeds the volume raised via early-stage VC financing. Bloomberg further points out the fact that many of this ICOs are subscribed within minutes and, in many cases, based on simple product proposals, not on tangible MVPs or initial traction. One last thing in the article that caught my eye is the fact that an increasing number of "traditional" bankers and investment professionals are migrating into this ICO universe. Many argue that there is a cryptocurrency bubble that could burst at any time following rapid price hikes in many tokens in the last months. Case in point: Bitcoin itself - price has quadrupled since January 1. An interesting point to assess is the correlation between bitcoin and other cryptocurrencies. I dare say that it is not clear cut and there is no one-suits-all conclusion. However, it seems safe to say that, in general terms, tokens price are positively correlated. This and this analyses (charts below) I came across online exemplify this point. the subset of people who think that financial markets are overpriced is a fairly large one...and they may be moving to cryptocurrencies to find yield, driving prices up as a result. In short, a super interesting, rather nascent ecosystem that is being developed at lightspeed and subject to permanent debate. Time will tell where the path ends.